Liverpool legend Steve McManaman has explained why there’s no longer any excuse for his old club not to pick up a trophy of some kind this season. 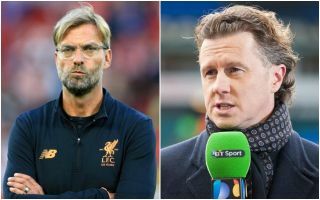 BT Sport pundit McManaman told CaughtOffside that, while Jurgen Klopp’s job does not necessarily depend on picking up silverware, it would be the icing on the cake after the team’s improvement in recent times. The German tactician has generally impressed in his time at Anfield, though he is yet to pick up a piece of silverware for the club, losing the League Cup final to Manchester City, the Europa League final to Sevilla and the Champions League final to Real Madrid. McManaman believes that the improved depth in the squad after some fine work in the summer transfer market and the experience the team gained on their run to the Champions League final means there’s no longer really any excuse for the club not to win something, even if he concedes the Premier League and Champions League will be difficult. ‘Last year if one of them (the front three) got injured then they’d be slightly weaker than you’d want them to be,’ McManaman told CaughtOffside. ‘But this year Daniel Sturridge is fit and playing well (and) they’ve got strength on the bench – (Xherdan) Shaqiri, Fabinho – players with vast experience … Naby Keita of course – and their experience of last year with the run that they had and the fact that they got over the line in certain games, they’re well equipped now and I don’t think there’s any excuses this time around. ‘You’d expect Liverpool – if they don’t draw a Manchester City in the knockout stage early on – you’d expect them to get through this group. ‘There’s four trophies they can win. It’s going to be difficult to win the Premier League or the Champions League, but I think most people feel now, we’re playing entertaining football … I think the icing on the cake now would be to get a trophy.